That’s fine. Neither do most people….who don’t have to live under them. But chemtrails are not just something you believe in, like some believe that there will be 75 nubile virgins waiting for them in Heaven if they just kill a few infidels. There’s no documentary evidence for that. But there is documentary evidence for the existence of chemtrails which is overwhelming and inescapably conclusive, and so here’s just a taster for some of it. 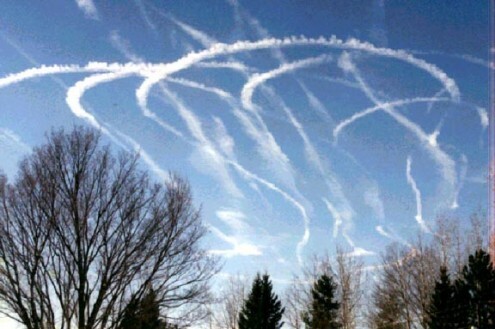 The chemtrail programme that we see today began in earnest in the 90s. However the technology has existed for a lot longer and there are other incidences of its use before the 90s. One notable example was in Britain from the late 50s through to the 70s, when large parts of the country were sprayed with chemicals for germ warfare experiments. This information was locked away in Government archives and has only recently been released to the public as 50 years have now passed. Many people have had children with birth defects because of this government sponsored aerosol spraying campaign. You can read the Guardian newspaper report on this incident at this link. The US government also deployed similar technology during the Vietnam War. They used cloud seeding technology to prolong the monsoon season to disrupt the Vietnamese supply lines. It was called Operation Popeye and was considered successful. More recently the Chinese government publicly used cloud busting technology during the Olympics to ensure that the skies remained clear. I cite these examples as evidence of weather manipulation technology that has been in use for many years. Although the chemtrail programme is slightly different, it is based upon the same technology that we know has been deployed historically. 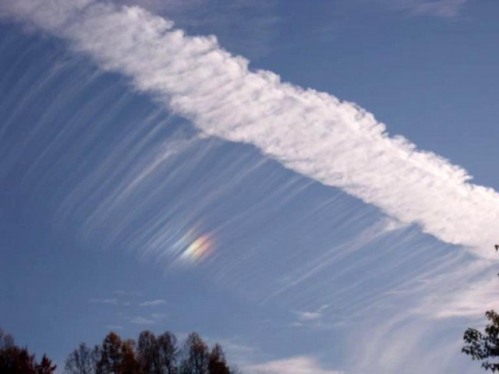 In the 1990s, people began to notice that the contrails normally emitted by aircraft were lingering in the sky, forming cloud cover and blocking out the sun. Some of these people could see that they were being sprayed with some substance, so in order to understand what it was, they had their rainwater and soil independently tested. The tests consistently found exceedingly high levels of aluminium, barium and strontium in areas affected by spraying. These tests have now been carried out in many countries around the world with the same results. Some of the countries in which tests have been done include the USA, Canada, Australia, New Zealand, Britain, France, Germany, Spain, France and many others. You can view some of these test results at the following link. From these tests people have become aware that they are being sprayed – but this gives rise to more questions than it answers. How are they doing this? And who is doing it? To try and answer the how, we can look at the list of patents that are related to this sort of technology, and from doing so can conclude that this is entirely possible. You can view an exhaustive list of easily verifiable patents here. These patents describe various ways of carrying out spraying. From mixing it in the jet fuel, through to dedicated spray nozzles with specially designed feeder tanks. From the patent record, we can also see that this technology has been around since before World War 2. It is also evident that some very sophisticated technologies have been developed over the years. So much so, that now it is possible to adapt nearly all types of jet aircraft to this type of use. People investigating have been monitoring aircraft to try and identify those that are carrying out the spraying. By using flight radar and other computer applications that identify commercial aircraft, investigators are able to determine if the aircraft passing overhead is civilian or not. With these types of applications, you are able to see the flight number, airline operator and other flight details. 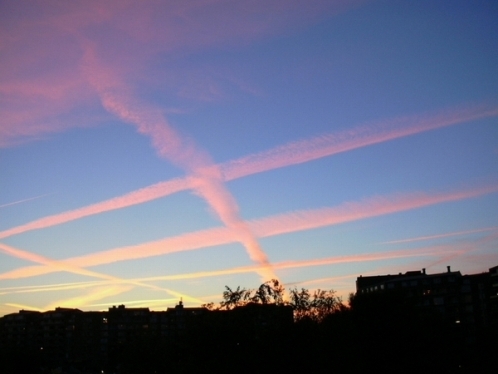 This has enabled investigators to identify many airlines that are involved in the spraying. Sadly there are a lot of them. Also by using modern cameras with high powered lenses, many excellent videos and photos exist and have been used to help identify those aircraft that are spraying. Military tanker planes are often observed spraying in NATO affiliated countries. Here is a small selection of existing videos and photos showing chemtrails as they are being sprayed and the effect of doing so. This video shows a chemtrail tanker plane turning on and off its spray nozzles. Notice the change in volume of spray as it does so. The following video shows a plane dispersing chemicals at a low-altitude over London. This video is a compilation of compelling evidence. From these photos and videos I think you’d have to agree that these are not regular contrails but are in actual fact chemtrails. In scientific circles the whole process is called geo-engineering. Just as a reminder, a normal contrail is caused by water vapour freezing in certain atmospheric conditions. These normally dissipate after a few seconds, but some may linger for up to a minute or two in the right temperatures. Here is a photo of a normal contrail with two huge chemtrails to compare it to. Many whistle-blowers have come forward to speak of their involvement in these programs. Here is the testimony of a flight mechanic who wants to remain anonymous. I’d like to hear feedback from other flight mechanics about the feasibility of this testimony. Allan Buckman, who worked for the US Air Force as a weather observer has also come forward to say that chemtrails are real. See here. A.C. Griffith an ex-US government employee has also come forward to give an insider’s view on chemtrail programmes. See here. This is but a small selection of insiders who have come forward to help expose chemtrail programmes. But not only have whistle-blowers come forward to give us information about these programmes. Other people have come spoken out, including Swedish politician Pernilla Hagberg who openly admitted that chemtrail programmes exist. See here. 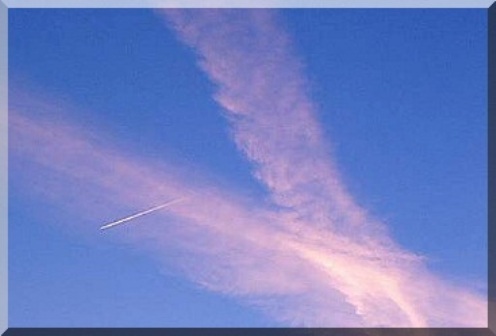 The German Air Force were caught spraying over Germany which appeared on the national news in Germany. See here. National Geographic recently published the following article about geo-engineering, admitting that it is already in use and arguing that it won’t work forever. (Like it is working now) See here. The globalist think tank, the Council of Foreign Relations, has advocated for geo-engineering programmes to fight global warming along with a ‘global’ administrative body to run the said programmes. See here. Climate scientists have proposed using this exact method of dumping millions of tonnes in the atmosphere to “fight global warming.” See climate scientist David Keith advocate its use on the 20th Feb 2010 at the American Association for the Advancement of Science meeting in San Diego at this link. Despite claiming that it is untested and that its impact upon human health is unknown, David Keith still is in favour of these programmes. Although in reality these programmes have already been ongoing for over 10 years before this conference took place. I haven’t explained to you why they are doing this and who is doing it, my aim was solely to convince you that this is a real programme for which there are plenty of facts and hard evidence to support its existence. It is my hope that I have inspired you enough to continue your own research into this assault upon the Earth and humanity. The only way to stop this, at present, is to tell other people and build awareness. I have included a number of links for you to begin to look at, at the bottom of this article. As you will no doubt agree, spraying aluminium into the atmosphere on an industrial scale is bad and must be stopped. Let’s stand together and stop this mass poisoning of our planet. You can help stop this by educating yourself and telling other people. Please start by sharing this article with your social circles!